I have previously posted about my dad being struck by lightning here. This was a brief article in the local newspaper in Clitheroe, Lancashire from 2000 looking back at events that happened fifty years earlier. As the archives for the Clitheroe Advertiser & Times have recently been added to the British Newspaper Archive website I can now share with you the original newspaper report from 1950. The following article appeared in the Clitheroe Advertiser & Times on 25 August 1950. A small zig-zag burn above his left eye and a splitting headache are the legacy of a flash of lightning which make 20 year old Mr Graham Dawson who lives at 102, Whalley Road, one of the luckiest people in Clitheroe this week. Standing on the front doorstep watching Wednesday’s severe thunderstorm, Graham saw a brilliant flash and then went blind. He stumbled back into the lobby of the house and tried to shout for help but could not speak. Thinking he had gone an errand Mrs Johnson, daughter of Mr and Mrs Musgrove, occupiers of the house, went to the front door and found Graham in a state of collapse. She shouted to her mother and together they supported him, but his sight did not return so they led him to a chair in the living room. Mrs Musgrove then ran to inform her husband who works at the Sun Street Mill and he immediately telephoned for the Doctor. He was attended by Doctor J H Fairweather and within half an hour his sight had completely returned though there was a slight swelling on his forehead and red mark. Mrs Musgrove said Graham, who was a farm worker, was already convalescing following an operation for appendicitis. At the time he went to the front door Graham was wearing wellington boots and it was undoubtedly that fact that saved him from more serious injury. Seen by an “Advertiser and Times” reporter yesterday afternoon, Graham said he went straight to bed after the doctor had been and apart from a bad headache and shock he did not feel any the worse for his remarkable experience. As a souvenir of a traumatic event he would never remember, the boy’s forehead bore the zig-zag of a scar, the only wound that the murderer could inflict on the infant. So there is the proof – my dad and his zig-zag burn became the inspiration for a certain boy wizard by the name of Harry Potter. Ernest Espley is the brother of my wife’s grandfather. 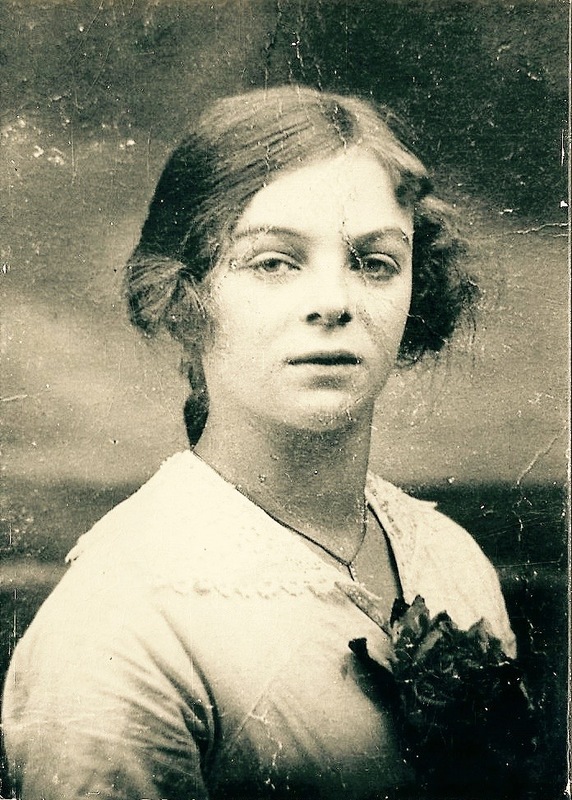 He was born in 1884 in Biddulph, Staffordshire. His parents were Frederick Espley and Frances Owen. 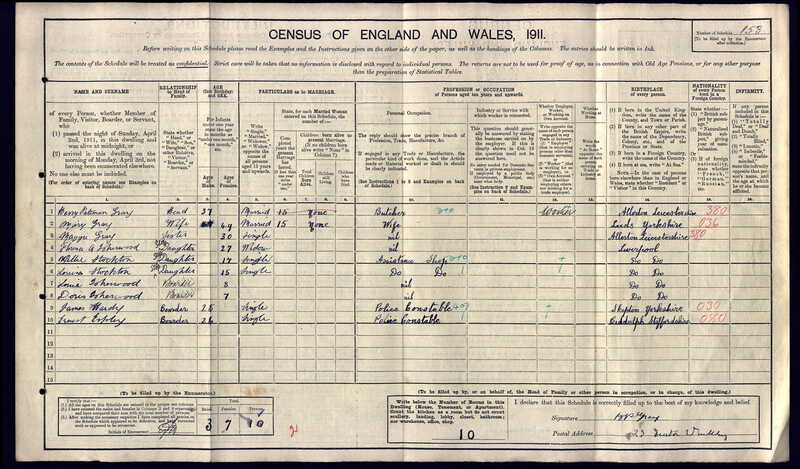 I have Ernest on the census returns for 1891 and 1901 in Biddulph. In 1901 he was working as driver in a coal mine. By 1911 Ernest had a complete change of career and location. He was now employed as a Police Constable and living in the West Derby area of Liverpool. 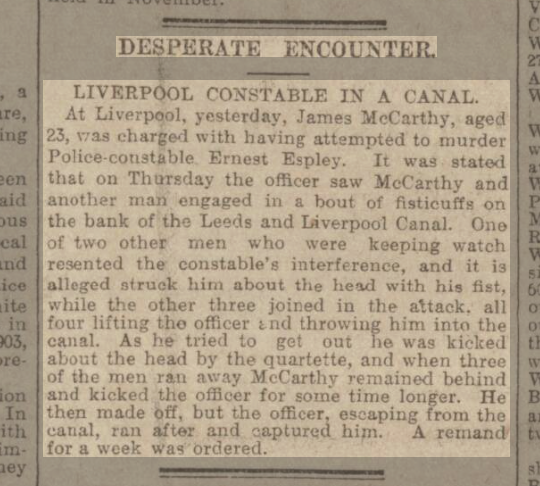 A trawl through the newspaper archives on Find My Past produced the following article from the Manchester Courier on 26 August 1905. All in a days work for a brave “bobby”.